Those were the words of Secretary of Energy Steven Chu as the heads of three federal agencies, Department of Energy (DOE), Department of the Interior (DOI), and Army Corps of Engineer (Corps), signed a Memorandum of Understanding (MOU) in March 2010 that signals strong federal support for hydropower modernization and growth in the United States. Under the MOU, the agencies have established a goal of increasing federal and nonfederal hydropower development, in an environmentally responsible manner, at federal facilities and on federal lands. The MOU represents a significant shift in hydropower policy in the United States. After decades of hydropower being viewed as a mature, fully deployed technology with little growth potential and significant environmental effects, times are beginning to change. With global climate change as a major priority of the Obama administration, with its attendant priorities of national security, job creation, and environmental protection, hydropower has emerged as a significant contributor to meeting policy goals. The MOU recognizes hydropower “[a]s the largest source of renewable electricity generation in the U.S.,” as well as its wide-ranging benefits. Hydropower is a “minimal emission, low-cost source of energy.” It stabilizes the electric grid by providing “long-term, stable production” of electricity, offering “consistent, reliable generation which can be quickly adjusted and dispatched to meet” demand, and helping to firm variable renewable energy sources through pumped storage. The MOU is intended to articulate a “new approach” to hydropower development in the United States, and given the parties to the MOU, the “new approach” could be far reaching. The three signatory agencies represent a substantial federal presence in energy policy development, hydropower generation, and regulation of nonfederal hydropower projects. The Federal Power Marketing Agencies, independent agencies within DOE such as Bonneville Power Administration, are wholesale electric utilities that market power primarily from federal dams. Through the Bureau of Reclamation, DOI operates some of the largest hydroelectric dams in the country. 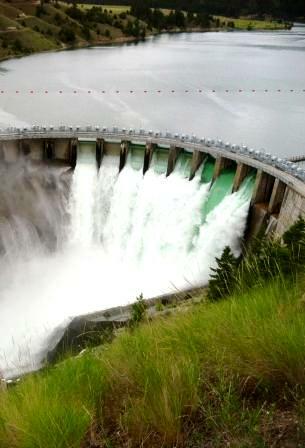 The Corps may be the largest owner and operator of hydroelectric dams in the nation. Moreover, several other agencies and bureaus within DOI are extensively involved in licensing and regulating nonfederal hydropower projects before the Federal Energy Regulatory Commission (FERC). Overall, the MOU establishes a clear action plan for meeting its ambitious goal of promoting hydropower development in the United States. Nonetheless, it raises certain questions that presumably will be answered during the implementation process. To begin with, implementing the MOU will require significant collaboration among stakeholders, including resources agencies; hydropower developers, operators, and customers; and the environmental community. Yet, three federal agencies that are indispensable in these discussions – FERC, the U.S. Forest Service within the Department of Agriculture, and the National Marine Fisheries Service within the Department of Commerce – are not signatories to the MOU. Any efforts to streamline licensing and permitting processes, enhance communications, and generally improve the authorization and regulation of hydropower projects in a manner that meets statutory requirements and promotes additional development will require the active participation and consensus of these agencies. In addition, the MOU raises but does not fully address the paramount issue of capital funding. While efficiency projects at a segment of federal hydroelectric facilities may be directly funded with nonappropriated funds, it is likely that most of the capital work contemplated at federal facilities would require funding through annual appropriations. Under current economic constraints, it may be difficult to secure appropriations for large capital projects. Similarly, the MOU is silent on promoting funding resources or initiatives with respect to nonfederal project development. Creative solutions to these challenges will need to be explored with stakeholders as the MOU is implemented. Reprinted with permission by Trends: ABA Section of Environment, Energy, and Resources Newsletter. This information or any portion thereof may not be copied or disseminated in any form or by any means or downloaded or stored in an electronic database or retrieval system without the express written consent of the American Bar Association.